Typically, June is the month where all NHL business is put to rest before everyone heads out on summer vacation. However, this offseason, the league is welcoming a new addition to the family in the Vegas Golden Knights. Speculation has already begun on a number of trades that could be consummated prior to the expansion draft that will take place June 18-20, with the results being announced June 21. 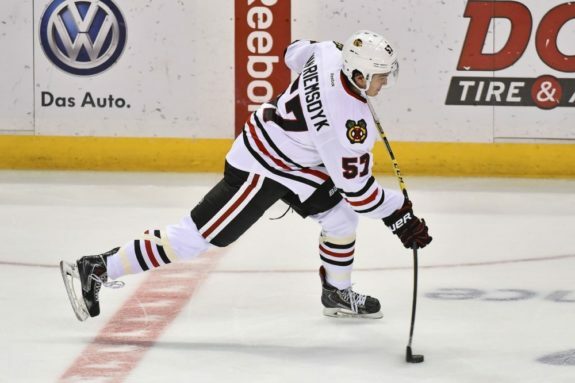 Reports emerged from TSN’s Frank Seravalli that the Knights are poised to pull a deal with the Chicago Blackhawks that allows them to select defenseman Trevor van Riemsdyk in the expansion draft if they agree to acquire center Marcus Kruger in a pre-draft trade. The Hawks are a victim of their own success, as they signed Stanley Cup heroes to long-term, non-moveable contracts, which has voided them of salary cap flexibility to repair a broken roster. Currently, the Hawks have just under $3 million of cap space to maneuver with this offseason. The Knights might have to accept a deal of this nature with no questions asked because of the opportunity to acquire a young defenseman with so much potential like van Riemsdyk. He’s a smooth-skating, offensive-minded back-liner who just needs some ice time to develop his overall game. van Riemsdyk isn’t going to receive that type of commitment from the Blackhawks because they have Duncan Keith, Brent Seabrook, and Niklas Hjalmarsson ahead of him in the lineup. Each logs significant minutes on the ice each night, which negates van Riemsdyk’s development. Kruger is a solid performer, but he is signed for two more years and has a cap hit of more than $3 million this season. There’s no question that he can become a key component to an effective penalty-killing unit, plus, Kruger can also generate quality scoring chances for his linemates on even-strength rushes. Ideally, Golden Knights GM George McPhee wants to team van Riemsdyk with another young defenseman, and give them time to form a partnership that leads the team to respectability. This scenario can be spoiled if the Hawks can find another viable trade partner that has space available on their expansion draft protective list for a player of van Riemsdyk’s caliber. 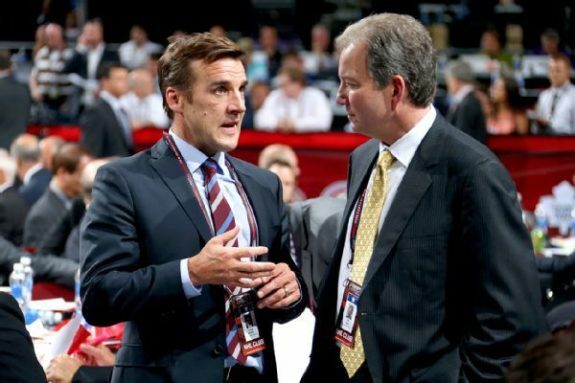 Golden Knights GM George McPhee is poised to make the right deals. You can argue that the Golden Knights would be doing themselves a disservice by taking on a bad contract and possibly spoiling their exclusive window of opportunity to speak with pending free agents. The NHL has granted Vegas 48 hours (from 10 a.m. June 18 to 10 a.m. June 21) to work out a deal with any free agent (restricted or unrestricted) left unprotected by their current team. It’s smart to gauge the interest of certain free agents, especially those desired targets that can play a significant role in the team’s success. Having a 48-hour window to negotiate a contract gives the Golden Knights a huge advantage over the rest of the league to sign players that are truly committed to making hockey a viable commodity in Las Vegas. However, under the expansion rules, they can only sign 10 free agents in their inaugural season. You have to believe that McPhee has a wish list already drawn up, but he must act fast or risk having to compete with the other teams when the free-agent frenzy officially begins on July 1. Expansion has opened up trade possibilities for teams looking to gain value for talented, unproven players they cannot afford to protect. McPhee must take full advantage of contending teams looking to keep their core units together by securing top prospects and/or high draft picks in exchange for not taking key components of the lineup left unprotected in the upcoming expansion draft. If he plays his cards right, McPhee could acquire a number of quality draft picks over the next few seasons that will accelerate the growth of the franchise. It’s hard to predict what direction the Golden Knights will go in building a roster, almost like wearing a blindfold and trying to hit a bullseye with a dart. McPhee is a master builder of a franchise mired in the ruins of mediocrity, so he will not endanger the Golden Knights’ future for short-term success. Remember, the NHL is a young man’s sport, which guarantees the Knights’ opening night roster won’t be a collection of ragtag talent from yesteryear. We’ll have to wait a few weeks before seeing how this scenario plays out. Nevertheless, exciting times lie ahead for Las Vegas hockey fans.